Native to South America, Bougainvillea is a popular showy vine because of its ability to produce vivid blooms 11 months out of the year. Hardy bougainvillea thrives in warm climates and is fairly low maintenance. 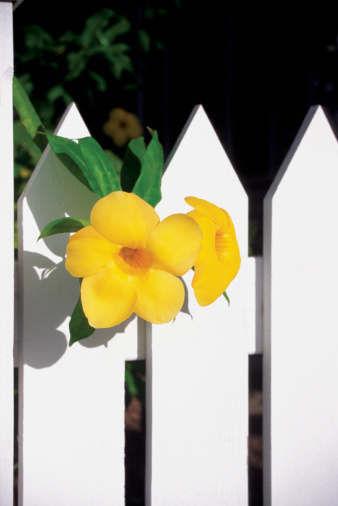 Depending on the variety, bougainvillea can grow anywhere from 1 to 30 feet tall. Plant smaller varieties in beds or containers or train larger vines to grow up a trellis or arbor. The more sun exposure it receives, the more vivid its pink, red, orange or white bracts, or leaves, will be. Choose a spot that receives at least six hours of sun each day. Bougainvillea plants love the hot sun and will grow best in an area without shade. They're drought resistant and thrive in loamy, well-drained soil. Be careful when removing the plant from the pot as the roots break easily. Gently loosen roots if needed, but otherwise, leave them alone. Dig a hole about an inch larger than the original pot and place the plant in the hole, backfilling it with soil as needed. Water the bougainvillea deeply to establish the roots. Bougainvillea require a thorough watering when first planted but don't require much water after that. Water them thoroughly every three to four weeks or so, taking care not to over water. Bougainvillea plants are drought resistant and prone to root rot, so a less-is-more approach to water is best. Viney varieties of Bougainvillea require an arbor or trellis for support. As they're fast growers, all varieties require frequent pruning. Remove any dead wood, and pinch young bracts to encourage new, fuller growth. Wear gloves when planting or pruning to avoid getting stuck with thorns. Trim bougainvillea any time of the year as needed. Other than occasional pruning and watering, bougainvillea plants don't require heavy care and will thrive in a nice, sunny spot when left to their own devices. Bougainvillea don't do well during extended periods of frost. Plant in containers in frost-prone areas to bring inside during cold weather. Compact or dwarf varieties of bougainvillea make attractive container plants. Choose a well-draining potting soil that doesn't have a high concentration of peat moss. Whether in a pot or planted in the ground, bougainvillea plants do best when they have a thorough watering and the soil is left to dry completely before the next feeding. As bougainvillea grow quickly, the size of the pot depends on how much you want the plant to grow. Choose a pot one to two inches larger than the original plant to keep it from getting out of control. Wider containers will encourage the plant to spread its roots and grow larger. Always be mindful of the roots. Bougainvillea plants have fragile roots, and too much handling will cause them to break. 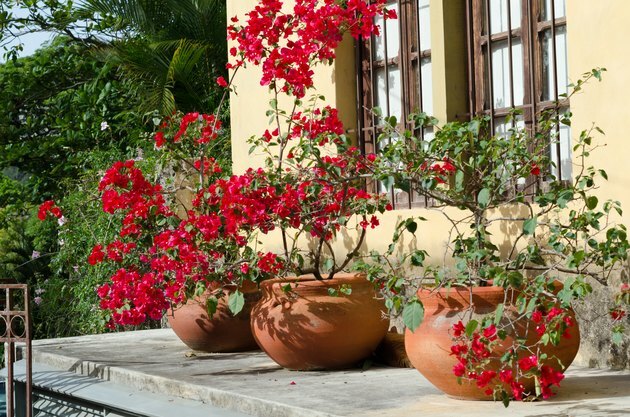 Once the bougainvillea is potted, choose a spot that gives it as much direct sunlight as possible. If bringing the plant into the house for the winter, choose a bright southern exposure.